There are many jobs in the food services industry. Some are more simple and involve cooking or other duties. Others are managerial in nature. The dining room manager position is a manager type position which you may aspire to if you enjoy directing others and love working in the culinary arts area. Dining room managers can be found in several different locations and work environments, including schools, large restaurants, hotels, cruise ships, and other settings. Where you decide to work will depend on your specific skills and aspirations and how hard you are willing to work to get there. The dining room manager should be efficient in food services and hospitality, and should enjoy helping people have a positive and pleasing dining experience. They should be someone with a pleasant personality and someone who can direct others in a busy environment. Their educational background should focus on the culinary arts or a hospitality field. 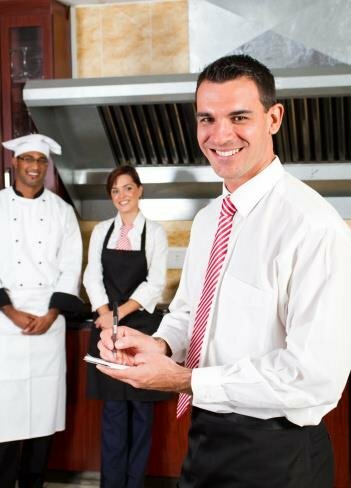 The typical education for a dining room manager would include a degree in the culinary arts, food services, and/or a hospitality or public relations area. The emphasis should focus on food services and organizational management skills. An alternate path to a career as a dining room manager would be a certificate in food services, experience as a kitchen manager in a restaurant, work in a catering business, or experience as a wedding planner. All of these work experiences could serve to prepare a dining hall manager for the things they will have to do on the job. 1) Get a degree or certificate from an accredited school in food services, catering, or a hospitality field. The coursework should include a focus on serving large numbers of people, organizational skills, and managerial skills. 2) Get experience as a food service worker or restaurant employee. Working in any capacity in an area of food service will give you the experience and skills necessary to do your job well. You can also express to the manager when you are hired, that you have a desire to move into a position of dining room manager if the opportunity comes up. 3) Connect with others in the food service industry. Use Face Book or social media to connect and network with others who work in the business. Sometimes you can get job leads that way, or at least share ideas with others who work in the business. 4) Ask to serve in the dining hall when appropriate to gain experience. If you aspire to become a dining room manager, volunteer to cover large events in which you serve a large number of people. You can put these experiences in your work portfolio and resume, and others will notice your dining room manager skills in the process. 5) Volunteer at civic events. If you hear of an opportunity to serve large numbers of people at events in your location, you could volunteer to help for free, in order to gain experience. Every experience can go down as experience in your career portfolio, whether you are paid for it or not. Life as a dining room manager can be an interesting career which can be performed in a wide variety of locations, settings, and situations. Some dining room managers may serve in the military, serving hundreds of servicemen and women, while others may serve in hotels, schools, or elaborate corporate settings. They all have one thing in common: they enjoy creating a pleasant dining experience for guests and love being around people. Dining room managers pay meticulous attention to detail and create an environment that is attractive and positive for attendees. If you think you have what it takes, look into getting your degree now in food services or hospitality and start on your career as a dining room manager.